I haven’t mentioned it in a while, but I used to grow a six-pack of tomatillos in the garden every summer and transform it in to a wonderful roasted tomatillo sauce. I made more each summer than I used up over the winter, and the stash in the freezer grew and grew. Howard finally said enough is enough, and it’s been several years since there were tomatillo plants in the garden. There is still tomatillo sauce in the freezer, though the supply is dwindling. At this week’s farmers market, I saw a pile of beautiful poblano peppers. 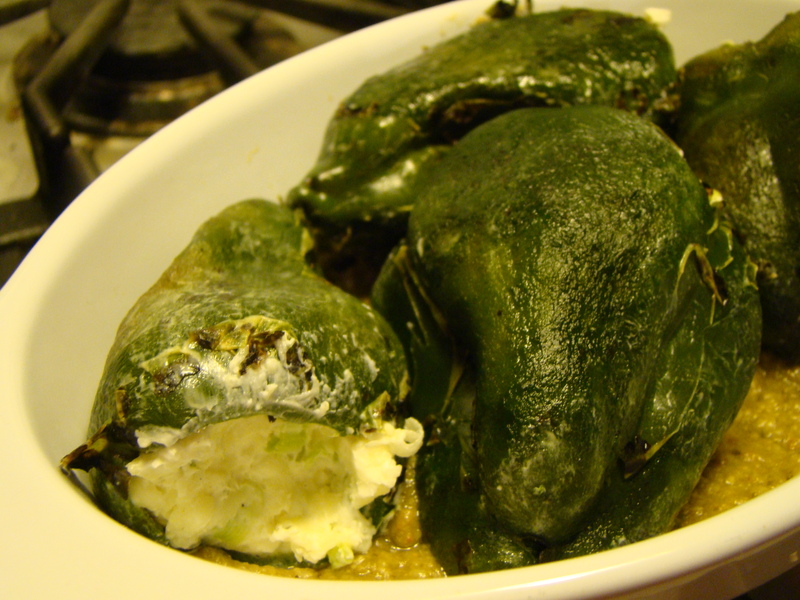 I love chile rellenos, so I picked up a few. The only thing is that I’m not big on frying. Fortunately, cheese-stuffed peppers bake up very nicely. I like the filling I use when I make jalapeno poppers, so I went the same route, combining grated cheese with cream cheese to bind it together. Lots of creamy gooiness! How does the tomatillo sauce figure into this? The peppers need something on top, of course. 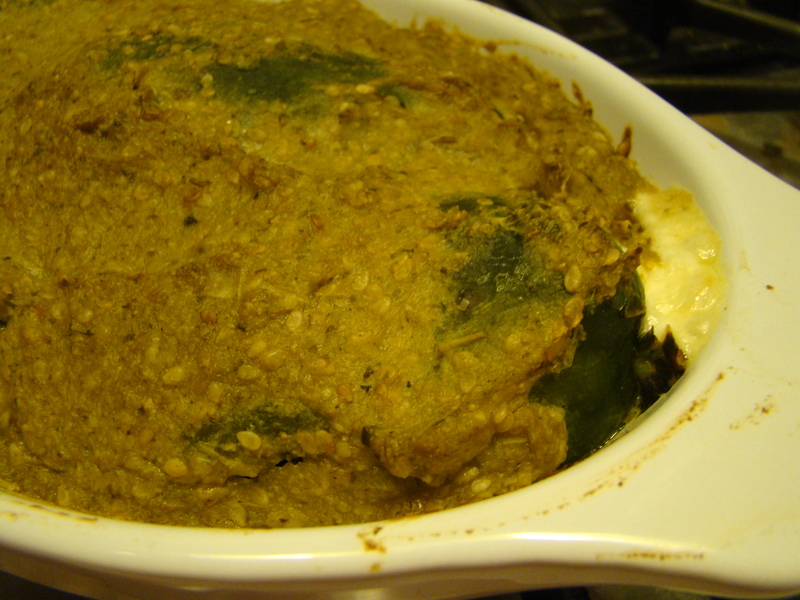 I tried something new, combining the tomatillo sauce with ground sesame seeds for Pepian Sauce. Poblanos were typically on the mild side, but the ones I used this time turned out to be somewhat spicy. The cheese helped. Good thing I didn’t go for the PepperJack cheese that I originally considered. Also, I think I drowned the peppers in too much sauce, though the tastes went together well. Char the skin of the peppers under the broiler or over a gas flame. Put the charred peppers in a covered bowl to steam. Peel the skin off the peppers. Core the peppers and gently remove seeds and ribs from the inside. To make the filling, combine cream cheese, grated cheese, and scallions. Divide mixture evenly. Form into an oval patty, and stuff each pepper. Cover the bottom of a baking dish that just fits the peppers with sauce. Arrange stuffed peppers. Cover the peppers with sauce. In a dry skillet, toast the sesame seeds until golden. Be careful not to burn them. In a medium pot, add the stock, toasted sesame seeds, cilantro and anise to the tomatillo sauce. Simmer for 30 minutes. Puree the sauce in the blender until smooth. It will take at least a minute. This week’s selected recipe for French Fridays with Dorie epitomizes why I joined this cooking group. Every week, I learn something new. Some weeks, it’s a new technique, some weeks, it’s a new twist on a familiar recipe, and some weeks, like this week, it’s a new combination of ingredients. Some weeks, what I learn is something I incorporate into my kitchen life, and some weeks, what I learn doesn’t make the cut. What about this week? I’ll admit that on paper, the recipe was uninspiring. 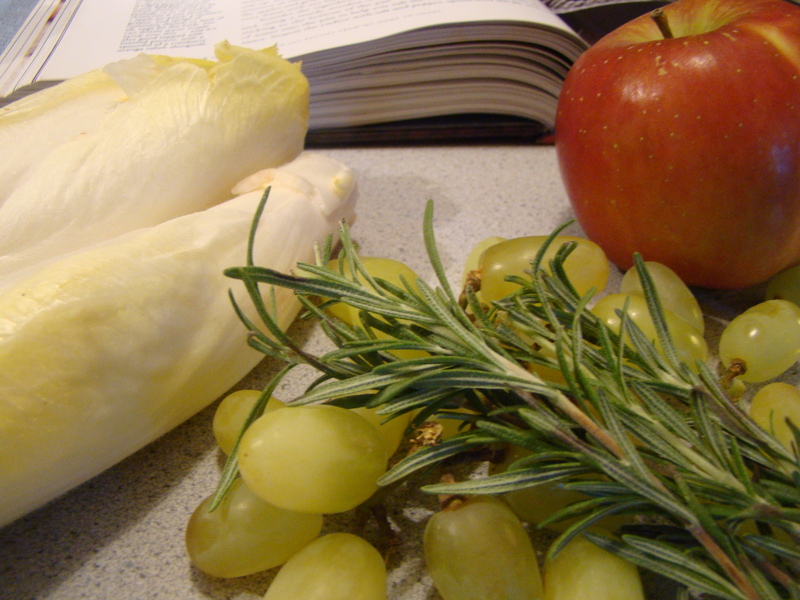 Endives, are OK in salad, but eating them cooked, caramelized, no less, with fruit, seemed downright weird. I gave it a try. 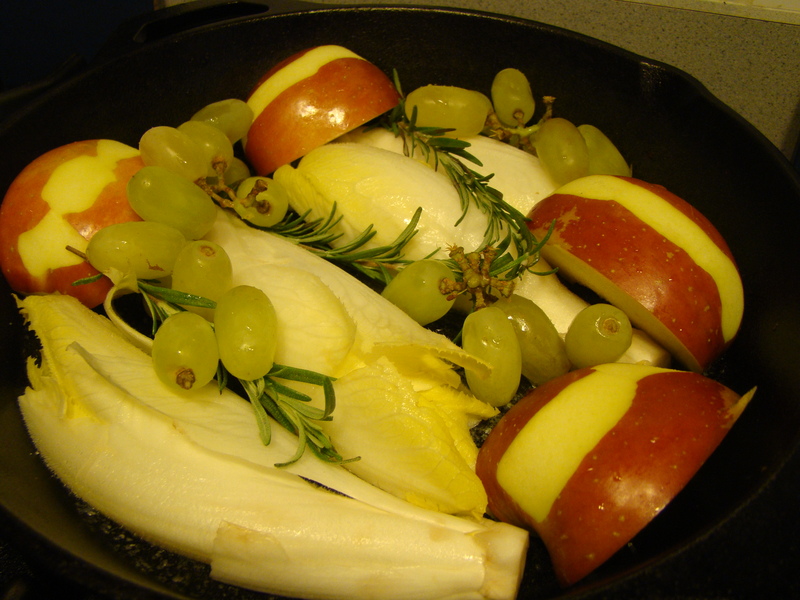 Endives, apples, grapes, rosemary braised in butter. The ingredients sit on the stove to caramelize, get flipped over, and the same is repeated on the other side. It really couldn’t have been easier. I used a seasoned cast-iron pan to do the work. I didn’t have the recommended salted butter, so used unsalted with a generous sprinkle of sea salt in the pan. My endive didn’t caramelize after 20 minutes, but I flipped it anyway. The second side did a bit better during its turn. I did flip the endive back over one more time, and let it sit while I finished preparing the rest of dinner, and it browned a bit more. What about the flavors? Much to my surprise, it has promise. On the plus side, I liked the texture of the cooked endive. 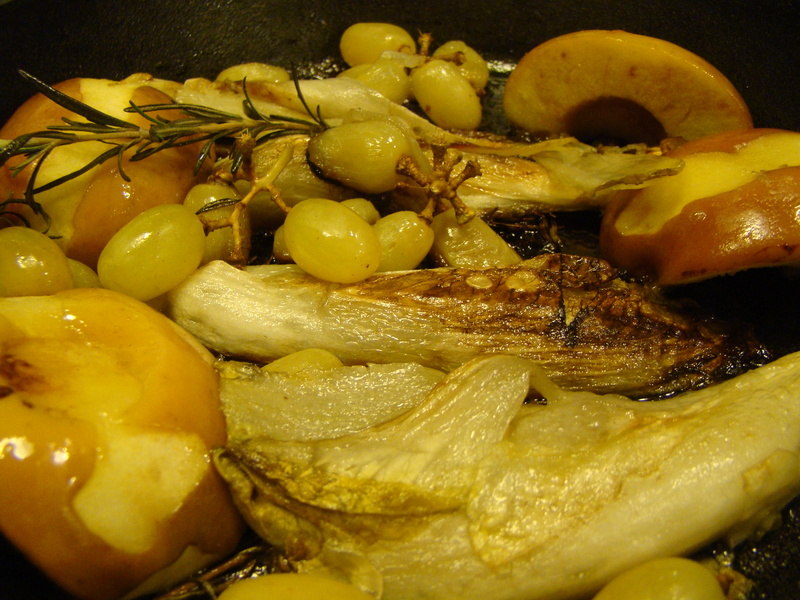 The caramelization and light fruit juices offset its usual bitterness. The grapes were the star of the show. They caramelized, they softened, they were delicious! As for what needs improvement, the apple (I used a Fuji) didn’t really soften (the opposite problem I had with the poached apples a few weeks ago). I’m thinking smaller pieces would have worked better, maybe eighths instead of quarters. Also, the rosemary didn’t seem to impart any flavor to the dish. It was quite aromatic when I put it in the skillet, so I’m not sure why I couldn’t taste it. Conclusion? I liked it much more than I thought it would. Chalk one up for FFwD as I never would have tried this recipe otherwise. As we move into to the season of heartier vegetables, I can see trying this again with a medley of other vegetables, like the winter squash suggested in Dorie’s bonne idée, Brussels sprouts, carrots, parsnips. The list could go on. I might drop the apple, but the grapes are definitely a keeper. We don’t publish the recipes for this cooking group, but Dorie already shared the recipe on Bon Appetit. You can also find it in Dorie Greenspan’s book Around My French Table. For other bloggers’ take on this unusual recipe, check out their links here.